These great little adaptors screw directly onto your keg setup. They allow you to push your beer/gas line with 8mm OD (5/16”) directly into the fitting. This makes it easy to disconnect the beer/gas line at a later stage and it eliminates the need to use hose clamps. 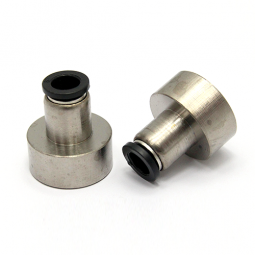 This unit will suit 5/8” BSP threads that are on our keg couplers, tap shanks and many other beer related fittings.